A San Francisco/East Bay Wake Up Call: Will Worcester’s Renaissance Benefit All? The success of this so-called Jane agenda will undoubtedly herald its own negative unintended consequences: the sacrifice of our greatest assets of affordability and diversity as well as the displacement of poor people. San Francisco and the East Bay should serve as a foreshadowing of what might become of us on a small scale. Although I’m not going to stop pushing for Worcester’s adoption of a Complete Streets policy that provides for equitable use for walkers, cyclists and car drivers, and I dream of the day when I can safely bike from my home to Union Station, I am well aware that bike lanes are also known as “white lanes of gentrification.” At some point five or ten years down the road (and the change can happen very quickly), my guess is that Worcester will meet the tipping point. People will become priced out as beer gardens and artisanal bread bakeries take over the barbershops and bodegas. Current homeowners might applaud this shift, benefitting from an increase in housing prices. City leaders will get excited about the economic growth. Worcester will have made it. But I ask, at what cost? In honor of urban theorist and activist, Jane Jacobs’ 100th birthday last May 2016, Joyce Mandell dusted off her computer keyboard, stretched out her typing fingers and opened up a Squarespace account for a new website that she named, “Jane Jacobs in the Woo”. Her commitment was to blog for one full year about her home city, Worcester, Massachusetts. Here were some driving questions: How would Jane Jacobs view Worcester’s development from our past choices of action to our potential future course? What would the ghost of Jane Jacobs say or do if she arrived by train at Union Station? And how can Worcesterites collectively engage in conversations and actions to build an organic, lively, people-centric, inclusive city inspired by the building blocks outlined so well by Jane Jacobs? Jane Jacobs in the Woo had the pleasure of getting to know Kaner Atakan Turker during Jane Week. Kaner was a regular participant on many of the Jane Walks and attended the film screening at the Worcester Public Library as well as the final Jane Award ceremony at Crompton Place. Please feel free to dig into this long and deep piece that analyzes Worcester, where we are now and where we are heading. Kaner's questions are important for all of us as we work towards the renaissance of our city. He asks, "Where will people of color and/or lower income be within the revitalizing/renewing Worcester? How much will they be incorporated to this transformation? What will their role be?" The Standells sing, “I love that dirty water” and Bostonians swell with pride for their city. It’s time Worcester identifies a song or two that speaks to our love and feel of place! Local songwriters, prepare to take out your song writing pen and your own Woo-muse. Jane Jacobs in the Woo and Make Music Day Worcester are pleased to announce a song contest to find a song or two that captures the personality of Worcester. There will be two winners: the People’s Choice Award will be given to the song that has the most votes from the public. Additionally, Jane Jacobs in the Woo will be choosing a song for the weekly introduction of a new podcast to be launched in fall 2017. Winners will be showcased at Make Music Day Worcester on June 21, 2017. Over 375 local people came out to walk, talk, debate and laugh with us during Jane Week, May 1 - 7th, 2017. Enjoy this photo montage of the excitement! 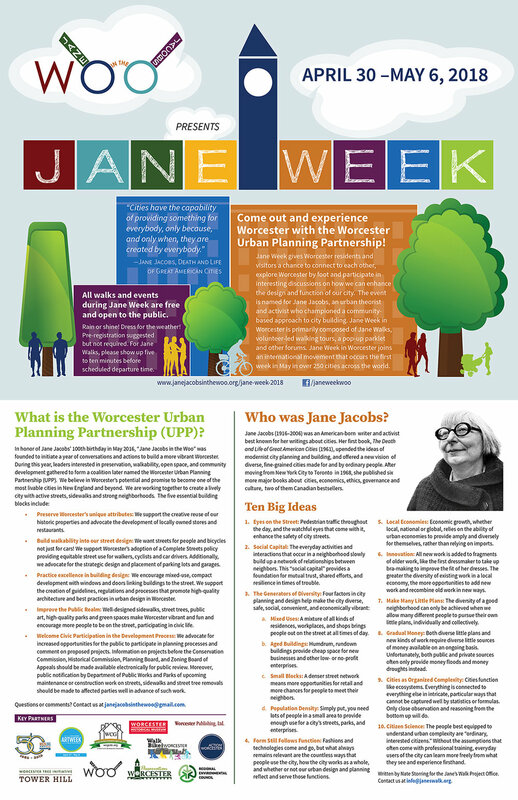 On Tuesday, May 2nd, the Worcester Regional Research Bureau kicked off Jane Week by organizing a forum on urban design review. A panel of representatives from Lowell, Springfield, Northampton and Boston detailed the processes their towns and cities have put in place to ensure development projects with design standards. The panelists had good advice for Worcester that we should be "asking for high quality developments." At a final ceremony on Sunday, May 7th to end the festivities of Jane Week, Jane Jacobs in the Woo presented the Jane Award to Crompton Place. Dino and Robin Lorusso accepted the award on behalf of the whole Crompton "family." John Giangregorio, Paul Dell'Aquila and Kyla Pacheko talk all things "Jane Jacobs in the Woo"
Listen to Steve Jones D'Agostino's latest episode of WICN's Business Beat: Paul Dell'Aquila, Kyla Packeko of Action! Worcester and John Giangregorio dish on how we can work collectively to build the Worcester Renaissance. Jane Jacobs is in the Woo! 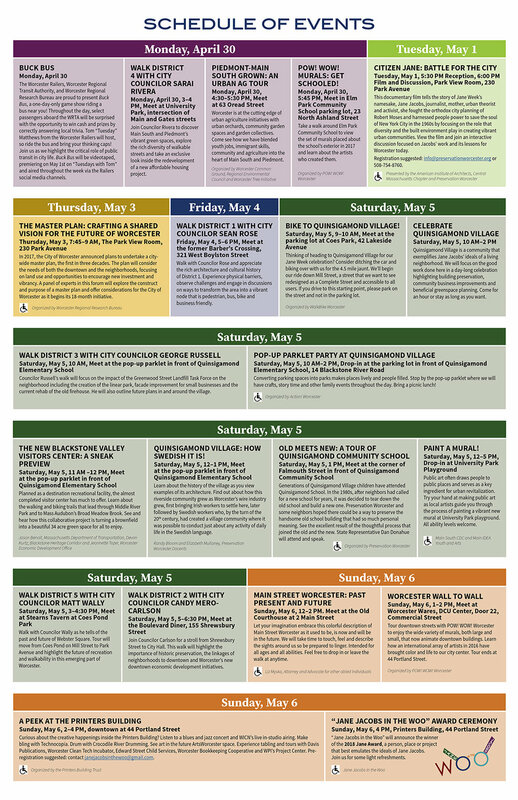 Over 15 Jane Walks, two public forums and one pop-up parklet party on North Main Street.... There is something for everyone. Dan Burden's message was very clear: The root of the traffic problem jam is NOT at the roundabout but further on up at the Front and Foster intersection and Front/Commercial signaling. LET'S FOCUS OUR ATTENTION ON THE ROOT OF THE PROBLEM. Jane Week is Coming May 1 - 7, 2017! Worcester’s urban development agenda since the 1960s urban renewal craze has been based on two major fallacies: 1) that historic buildings such as Notre Dame serve as an impediment to economic progress; and 2) fuzzy-headed nostalgia (not economic rationalization) drives the work of historic preservation. Jane Jacobs in the Woo will be hibernating until the spring. With over six months of blogging under our belt, it's time to digest what has been learned, read and think and reach out in real time and space to partners in the city. Although we are shifting our online presence, our work will continue full time offline. Please put Jane Week, May 1 - 7, 2017 on your calendar. We will be planning Jane Walks all over Worcester, surprising tactical urbanism projects, a lecture or two and of course a party with a cake honoring the culmination of Jane Jacobs' 100th birthday year. See you in the spring! Almost everything you need to know about the ideas of Jane Jacobs is in this simple, elegant graphic. Enjoy! With the right rose-colored glasses, one can literally change one's perception about the place where one lives. In order to feel some pride in her new town, Melody Warnick decide to develop a tour of places she could showcase to out- of- town visitors. She posted a simple question on her social media accounts, "What's the #1 thing you'd tell a tourist to do in Blacksburg?" So, I decided to do the same thing. I posted the very same question about Worcester on my facebook page. Within a couple of hours, Worcesterites were having a party in the flurry of comments back and forth. Some people mentioned the standard places (Worcester Art Museum, Ecotarium). Others left the borders of our city for fun (Tower Hill Botanic Garden, Purgatory Chasm). Several people mentioned things to do that I had never heard about before (a tour at the Regal Pickle Factory on Mason Street, stargazing with the Aldrich Astronomical Society at Anna Maria). In less than a couple of hours, my friends had generated a sizable brainstorm of cool things to do in our gritty city. Want to feel more attached to Worcester? Find someone like Tony or Fatima who know how to feed you outside of your own home and kitchen. Forget the chain restaurants and find the little places way-off-the-beaten-track where you can get to know the owner, the chef, the people who wait the tables. A special thank you to Chris Robarge. Within half an hour on facebook, we riffed off of each other, generating this starter list of restaurants. Some are well known and others are as yet undiscovered gems. Let’s eat local! The highway now functions as a subtle barrier between the triple-decker housing stock on the hill and the commercial district below. Although sidewalks grace both sides of the highway overlook, the highway still becomes a psychological and even physical divider of the space. It's the unexpected "find" one discovers that make cities so much fun. Walking to Nu Cafe, I stumbled across this mobile bicycle library on one of the side streets. This "little free library" offers anyone a chance to take or give a book. Books then become a shared community resource on the street. Isn't this cool? Remember why Melody Warnick advocates for us to fight for the little things in our cities and towns. Getting political locally helps ground us in the places where we live. Sit on a city advisory board. Testify at a Tuesday city council meeting on an issue you care about. Speak out for more trees, better train service, more consistent trash collection. Attend a local rally. When we dare to take a stand on a Worcester issue, we place another stake in making our city a place where we want to live.